The Métis are one of the most enigmatic Aboriginal peoples in Canada. While many of us may know they have First Nations and European ancestry, and can name-check charismatic leaders such as Louis Riel, beyond these basics, we tend to come up blank. Brenda Macdougall, a professor of geography at the University of Ottawa’s Institute of Canadian and Aboriginal Studies and Ontario’s first Chair in Métis Research, wants to address this grey area. Her answers to questions about Métis identity, however, are rarely black and white. 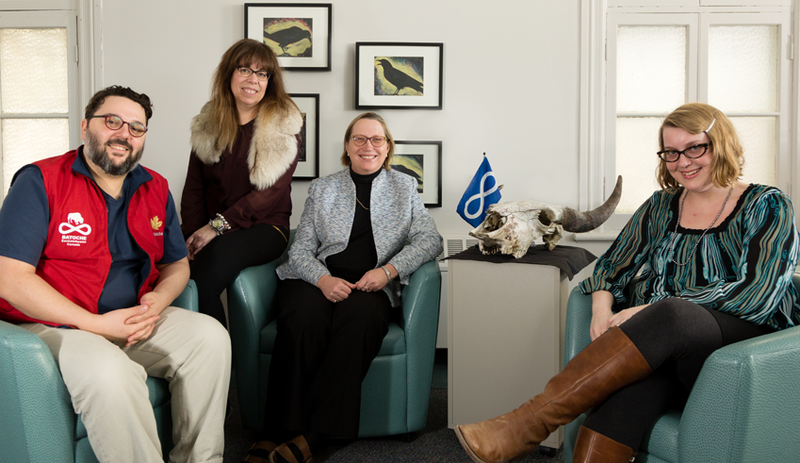 Macdougall runs the University’s Métis Family and Community Research Lab. Working with Nicole St-Onge, professor of history and chair of the Institute, along with other collaborators and students, she has collected 35,000 sacramental records dating back to the early 1800s from the Prairie provinces and the northern United States. These missionary accounts of marriages, baptisms and deaths have been photographed and transcribed into a database. By studying how families evolved and developed relationships, Macdougall plans to create a genealogical map of Métis history. But the culture at the heart of her project — and her own heritage — is fluid. The Métis were a mobile people, and communities formed at different times in different locations. With help from St-Onge and campus cartographers, Macdougall hopes to devise ways to depict Métis history visually, first on the Great Plains (on both sides of the Canada-U.S. border) and eventually in Ontario. There are tangible applications to this research, which is funded by the Social Sciences and Humanities Research Council and Aboriginal Affairs and Northern Development Canada. Macdougall frequently speaks to federal and provincial policy-makers and has made presentations to groups of senators, lawyers and teachers. When issues such as hunting and fishing rights or land claims arise, her ideas help inform decisions and debate. Macdougall was born and raised in Saskatoon. Her father, a bush pilot, was Métis; he grew up in Manitoba’s Red River Valley. Fuelled by family links to the fur trade era, Macdougall loved history as a child and read books about Riel and the rebellions he led. But coming from a working-class background, after high school she chose a practical path: science. She almost failed her first year at the University of Saskatchewan. An aunt staged an “academic intervention,” inviting friends who were humanities professors over for dinner, and Macdougall realized that she could follow her interests without sacrificing ambition. After earning an MA in history at the University of North Carolina, Macdougall returned home for a PhD in native studies. She wanted to explore how Métis society is created and exists within a space, and focused on northwestern Saskatchewan. This region and a genealogical methodology remain central to her research. The Métis are a post-contact people with a short history and a complex culture. There are regional differences between Ontario and Plains Métis, and francophone, anglophone and various indigenous influences. The children of First Nations women and white men were not necessarily Métis, says Macdougall. “They have to be born into a social scape where there are other people like them. They need to grow up together and interact with one another. Society evolves out of the way that people create relationships.” And mapping out these connections, she knows, will deepen our understanding of the national mosaic. How are francophone and Scottish surnames intertwined? What tribal nations were the mothers of Métis children from? How did the social structures of these nations impact the families that emerged? These are some of the questions being explored at the Métis Family and Community Research Lab, a computer-filled room in William Commanda Hall decorated with bison skulls and sculptures and the Métis infinity symbol, which represents the joining of two cultures and the existence of a people forever.